Where do I find recipes for kids’ lunchboxes that are also gluten-free? If you’ve been asking yourself that question, here’s the answer: Look no further than this site. Welcome to Gluten-free Lunchboxes, your one-stop gluten-free kids’ lunchbox resource and my labour of love. Feel free to take a look around. How did I get here? My story’s below. Sound familiar? That was our daughter before her diagnosis of coeliac disease. Maybe it is your child, too. We struggled with our unwell, unhappy little girl until, at age 4 and a half, she finally was diagnosed. A major dietary change, especially in a child, is a daunting thing. You worry about them missing out, fitting in, and going on a play-date. Would she make good food choices without me being there to check on her? Her diagnosis was the best thing that has ever happened to our daughter. She is now a thriving, bright, healthy eight-year-old, thanks to her gluten-free diet, which she has followed for four years now. And if we ever needed more proof, her growth charts say it all. Since her diagnosis, she has gained more than 14 kilograms and is a picture of health. Simply amazing. Looking back, even though she was so sick for so long, it was a great age for the diagnosis. She was old enough to remember how sick she felt, but not so old as to fondly remember the light and fluffy texture of a finger bun or other gluten-filled goodies. A blessing because, even though there’s been accidental exposure to gluten from time to time (an unfortunate fact of life), she’s never cheated; she’s never decided to cheat because she’s really badly wanted to eat something. It’s partly due to her memories of being sick, partly because she thinks gluten is poison (and for her, it is), and partly because I always try to have a gluten-free alternative for whatever situation in which we find ourselves. And now, thanks to my gluten-free girl, I have founded and authored this blog, dedicated to gluten-free kids’ food, with a specific focus on the mightiest of challenges – the school lunchbox. Kids’ lunchboxes are a tricky business for any parent, but it’s in another ballpark entirely when you take away the gluten. Yes, it’s true that there are plenty of gluten-free foods available, but I’d prefer that my daughter didn’t exist on a diet of processed food. Even gluten-free foods can be full of many of the same additives (often in higher quantities) that are found in ordinary foods and, let’s face it, most of our kids could do with a lot less sugar and salt in their diets. Add to this the difficulties that coeliacs can have with calcium and iron absorption, as well as the need for increased dietary fibre, and you are getting a picture of the challenge. I like to cook, but am by no means an expert. Nor do I have any dietary or medical expertise. In fact, in my past lives as a lawyer and musician, my expertise lies far from the kitchen. So here I am, a mum of three kids, about as time-poor as everyone else, and looking for a bit of inspiration. I hope that through this blog I can share my ideas with you and that you may have some ideas to share with me. My blog unexpectedly led me to write a cookbook, which is available on this website in electronic form. It’s full of kids’ lunchbox recipes for recess time, lunch time, evening meals (with ideas for converting the leftovers to lunchbox fare) and a few special occasion recipes. Just click on the button to buy. 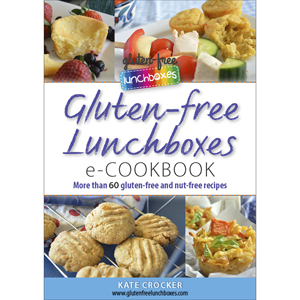 Buy your one-stop gluten-free kids’ lunchbox cookbook! Yep, a kid going gluten-free requires organisation and forward thinking. Yep, sometimes it’s hard, sometimes it’s tiring. And yep, sometimes she frets about her dietary restrictions. But nup, I don’t have a single regret. Not ever. She’s happy, healthy, sparky, funny, witty and just a wee bit crazy. Just the way I love her.